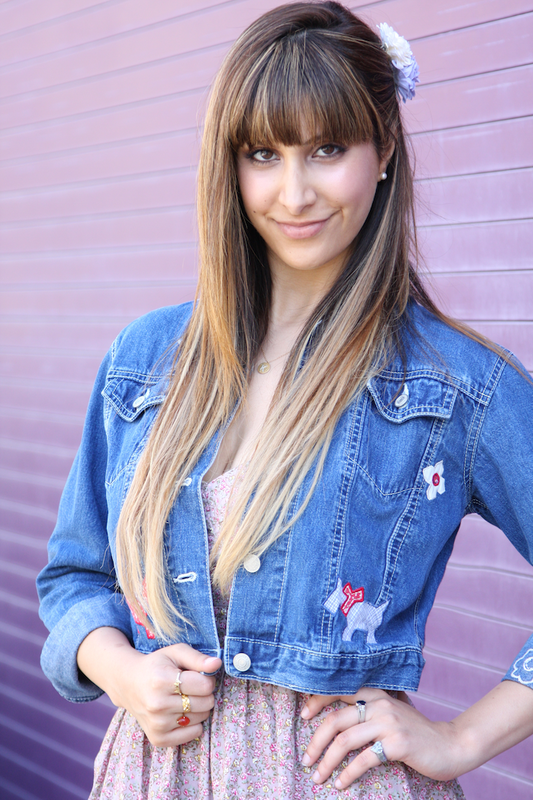 As many of you know, my style is very 90s inspired, so this look is no surprise ;) We have a fitted, floral, bustier dress that I layered with this vintage denim jacket I found in L.A. a few years ago. I love this jacket because not only is it cropped, but it has little sewn on patches of dogs that I find adorable and completely a 90s throwback! I'm wearing my ruffled socks, which I'm obsessed with by the way, and my cream combat boots also harkening back to my favorite decade. And to top it all off, I am of course wearing flowers in my hair!! This outfit is easy, fun, and youthful, as well as being simultaneously modern and a throwback. Hope you all are having a wonderful Memorial Day weekend! !